Shambhu Mahato, a peasant who owns less than two acres, has to migrate to Kolkata to earn money to reclaim his tiny share of the good earth from the moneylender. Working there as a rickshaw-puller, he saves paisa after paisa to pay his debts but after the turmoil in the cruel city, he returns to find out that the land is gone and a factory is being built there. He leaves with his wife and children for the city again with just a handful of the good earth in his hand. A Manna Dey-Lata Mangeshkar song of the film, set to evocative musical score by Salil Chaudhury, has the ominous refrain: "Apni kahani chhodh ja/ Kuchh to nishani chhodh ja/ Kaun kahe iss ore tu phir aaye na aaye". 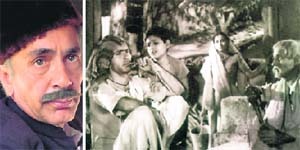 The story was indeed etched forever in Do Bigha Zameen (1953), a path-breaking film by Bimal Roy, which was the first Indian film to win the Prix International award at the Cannes Film Festival, besides the Award for Social Progress at the Karlovy Vary Film Festival and the National and Filmfare Awards. Shambhu, played memorably by Balraj Sahni (1913-1973), who ironically won no award, was the big break for the actor, who gave some fine performances in commercial as well as parallel cinema. Although he began his film journey with his first wife Damayanti, the India People’s Theatre Association (IPTA) film, Dharti ke Laal, it was as Shambhu that he actually arrived and went on to do some outstanding roles in films like Seema, Garam Coat (1955), Sone ki Chidiya (1957), Heera Moti (1958), Anuradha (1960), Kabuliwala (1961), Haqeeqat, Waqt and many more right up to his farewell performance in Garam Hawa (1973). Singer and actor Kamal Tewari says in a tribute, "He was a cinema actor ahead of his times. He was as influenced by neo-realism as Bimal Roy and understatement was his forte as against the highly stylistic acting of Hindi cinema which had its roots in Parsi theatre." Balraj was the elder son of a wealthy cloth merchant of Rawalpindi. A Masters in English Literature from Government College, Lahore, he briefly worked with his father but then left home with Damayanti to pursue intellectual interests in togetherness. These included a stint as an announcer with the BBC, teaching at Santiniketan, joining the IPTA and becoming committed Marxists. Damyanti, a fine actor, died young in 1947 leaving behind two children, Parikshit and Shabnam. Two years later, Balraj married his cousin Santosh and they had a daughter, Sanovar. While his career blossomed, his personal life remained despondent. He confessed the envy he had felt when Damayanti did better than him and regretted it. As an actor, Balraj excelled in both commercial and offbeat cinema. In the collective memory of cine buffs, he is best remembered as Lala Kedarnath in Waqt, directed by Yash Chopra and produced by B.R. Chopra, singing to a blushing Achla Sachdev: "Ae meri zohra jabeen tujhe maalum nahin, tu abhi tak hai haseen aur main jawan". In a centenary analysis of his spontaneous talent, literary and cine writer, Jai Arjun Singh, writes: "However, it may be a mistake to judge Sahni only by his work in "respectable" cinema`85 A continuing joy for any true Balraj Sahni fan is discovering his performances of integrity in dozens of "unworthy" roles, a reminder that acting in a commercial medium isn’t just an ivory-tower pursuit, and that the true artiste can achieve big things across a range of canvases". Weighed down by the tragic death of his daughter Shabnam, Balraj gave one of his best performances in M. S. Sathyu’s Garam Hawa, based on a story by Ismat Chughtai and adapted for the screen by Kaifi Azmi. It depicted the crisis of a Muslim family that chooses to stay back in India while all relatives leave for Pakistan. Balraj as Salim Mirza is witness to his daughter Amina, a case of art mirroring life, and the unhappiness of his young unemployed son. He decides to migrate but the end is one of hope and father and son decide to stay back and struggle with other Indians. Commenting on the film, veteran theatre director Rani Balbir Kaur says, "Balraj was a star but he chose to do this film for free because it was close to his heart. I met the actor in Chandigarh when he came to meet Damayanti’s brother, who lived here. He was so handsome, graceful and as fine a person as he was an actor." Balraj died of a heart attack on Baisakhi, April 13, 1973, and his last wish was carried out. A communist manifesto was placed on his heart and he was draped in the Red Flag. For his role of Shambhu, he practised pulling the rickshaw on the streets of Kolkata with his children Parikshit and Shabnam sitting in it. Although acclaimed for his acting, he never received an award as an actor but that did not bother him because his art was aimed at social progress. His younger brother Bhisham Sahni was the acclaimed writer of Tamas fame, yet Balraj loved to write and turned to Punjabi to write his travelogues of Russia and Pakistan. His autobiography was published posthumously. He was associated with Gurbax Singh Preetlari's collective and had a house there which was sold by his wife a few years after his death.